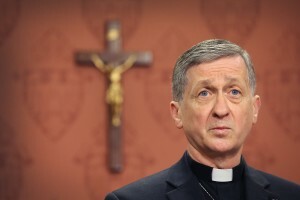 A question for Cupich: When does “Zero Tolerance” begin? When does Zero Tolerance begin? If you found out that a new priest in your parish had admitted to his superiors (but not the parish) that he had sexually abused a child, would you be upset? What if you found out that the abuse occurred before the priest had been ordained? What if you found out that the priest had been a teenager when he sexually abused a seven-year-old boy? What if you knew that another archdiocese had kicked the priest out, citing Zero Tolerance? What if you found out that despite the admission, your local archbishop gave this priest faculties in your archdiocese (that is, permission to act as a priest) and the archbishop said that the priest was not a risk to children? Would you be upset? Would you want this priest around your children? So when does Zero Tolerance begin? Does it begin at ordination? Does it begin at puberty? Does is begin at birth? These are questions we should all be asking in Chicago. ** and a note: if any priests are quietly removed without the full truth, that’s definitely not Zero Tolerance. to me.. “zero tolerance” and catholic clergy equals. zero..
the pope/cardinals/bishops have given themselves permission to lie to “protect the church from scandal”.. and that will never change..